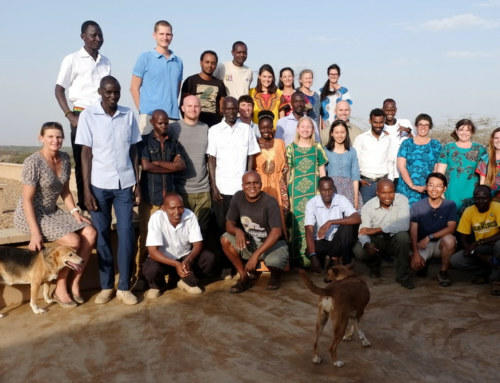 After a few days of getting settled into their routine at Mpala research center, the students were ready to begin their first module: Ecology. 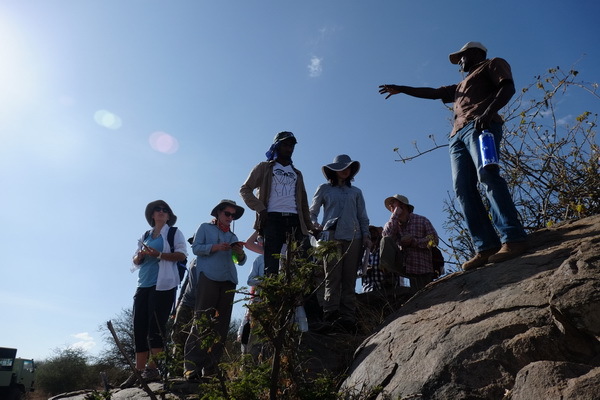 For an introduction into dry land plants, Kenyan Botanist, Kimani, took the students around the research compound to look at the local plant life. Kimani showing the students different types of plants around the compound. Photo credit Deming Yang. Plants in this area have many adaptations to living in such a harsh environment including shedding their leaves to prevent water loss and armory (ie. Thorns) to help them escape being eaten! 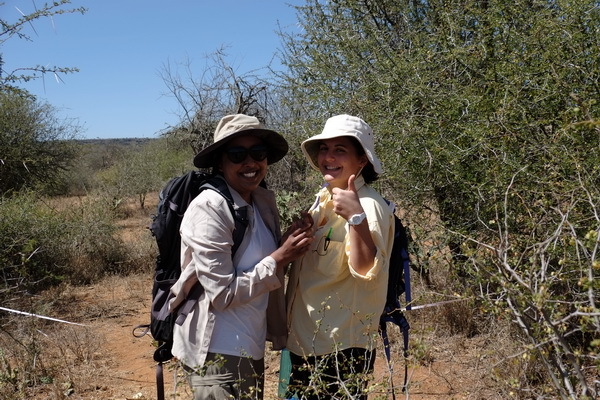 Izzy and Kim looking at a thorny acacia plant. In addition, Kimani taught the students about how plants in this area are important in every day life. For example, plants in the mint family are commonly used as a mean to control insects and a plant called the Solanum can be put on a wound as an antiseptic! Andrew taking a whiff of the mint plant Plectranthus! 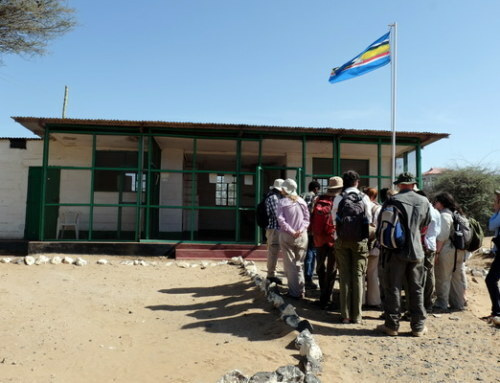 After this intro into dry land plants within the compound, the students were taken on a drive to see the differences in plants outside the compound. With Kimani, students learned about the importance of soil fertility and how this controls many other factors including plant height in this area. 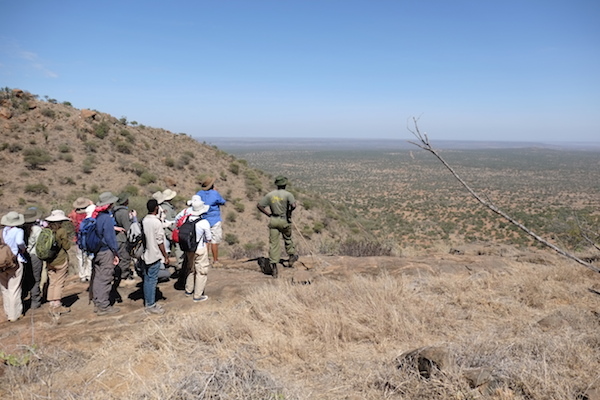 Kimani giving a lecture in the field. Photo credit Deming Yang. Also looking around, students noticed the bark of a tree differed in color in the center of the trunk. Kimani informed the students that this was actually due to elephants rubbing against the tree! 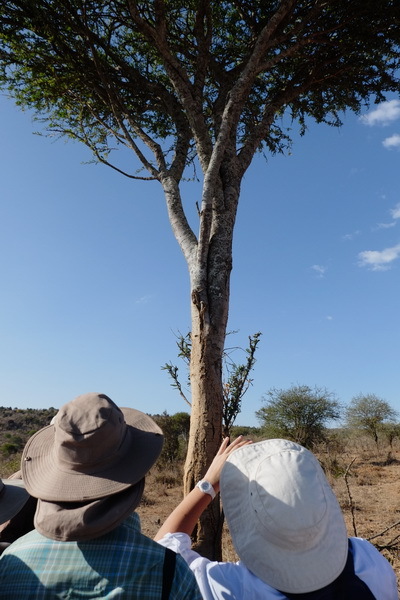 Andrew and Leah inspecting the Boscia tree… which is essentially an elephant scratching post! Photo credit Deming Yang. After this introduction to dry land plants, students were ready to begin some ecology work of their own! A type of cactus, known as the “Prickly Pear” is an alien invasive species to Kenya, meaning that it is not native to this area and has become dominant over other plants. 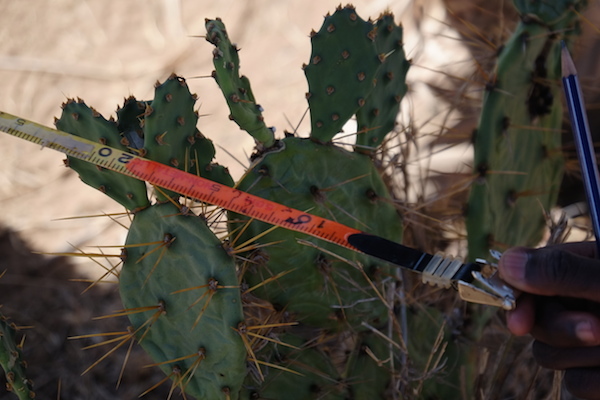 A Prickly Pear plant being measured. Photo credit Deming Yang. Researchers in this area have introduced a species of bug, known as the cochineal bug, that feeds on this cactus and can help combat cacti expansion. 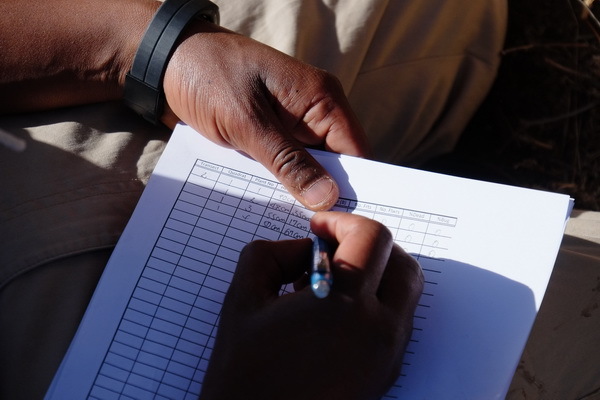 With the help of Kimani, students set out to collect data on the cacti by taking measurements of the plants and also estimating how much of each cactus was infected with the bugs. 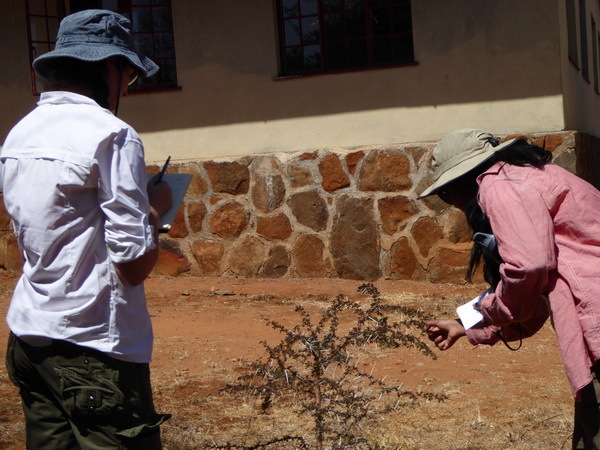 To do this, groups of students used tape measures to lay out transects and every 50 meters all plants within a 10 meter radius were measured! 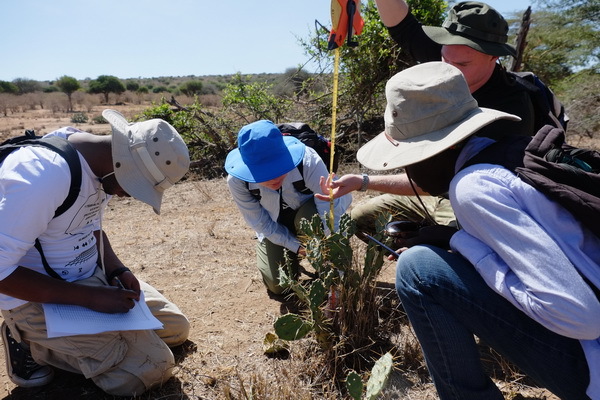 Yared, Amanda, Felix and Ester work together to take measurements of the Prickly Pear. Photo credit Deming Yang. 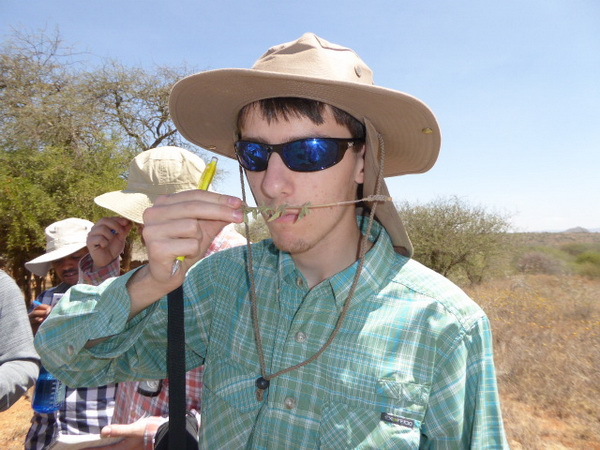 Yared recording his group’s data on the Prickly Pear. Photo Credit Deming Yang. After the data were collected, TA Deming Yang led the students in discussing possible ecological factors that may influence the distribution of the Prickly Pear. The students provided great explanations for what we saw in the data and learned a lot about ecological field methods! 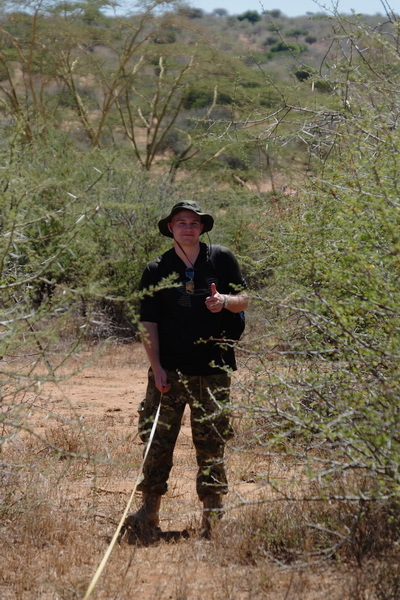 Felix signaling a job well done as he lays down the transect. Photo credit Deming Yang. 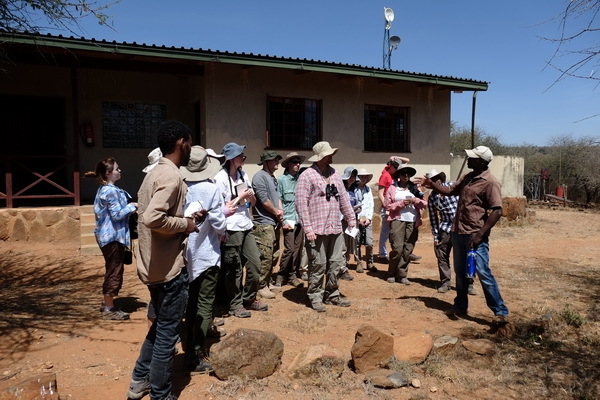 Students were in for a treat when Adam Ferguson, an Mpala researcher that works on a project called SCRAPS (Small Carnivore Research and Parasite Study) took them into his lab as he was taking samples from a common Genet. 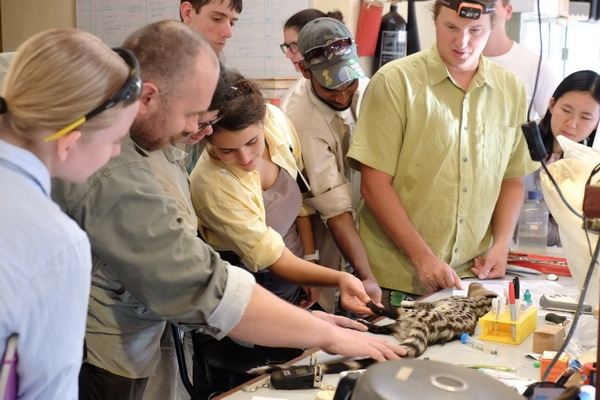 Students observing the Genet with Adam Ferguson. Photo credit Deming Yang. 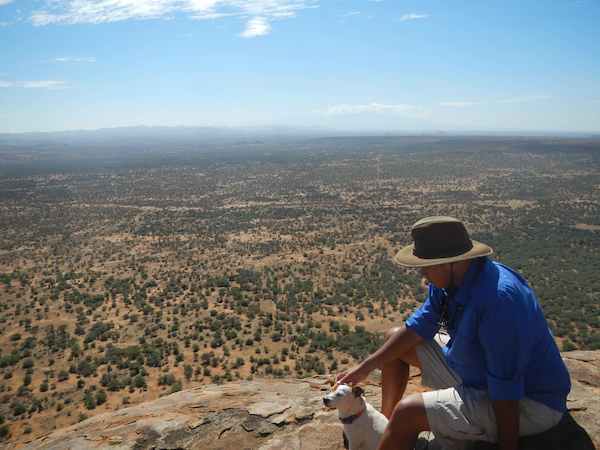 The Small Carnivore Research and Parasite Study studies how human interactions along with their livestock affect the behavior, Immune function and parasite infection of small carnivores in Laikipia county, Kenya. To do this, Adam Ferguson, along with a team of researchers temporarily traps and takes samples from various small carnivores. 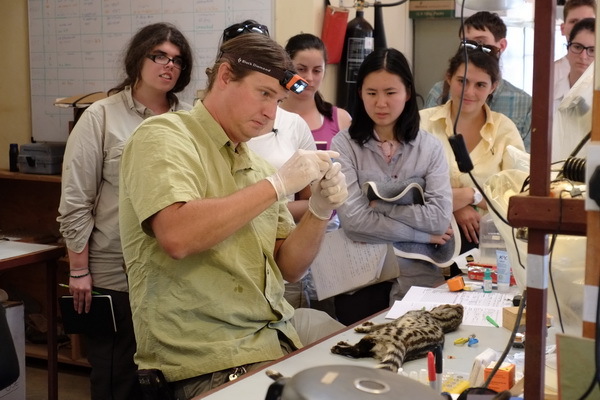 Students watching as Adam takes samples from the Genet. The Genet is under anesthesia and will be returned to the wild once it wakes up! Photo credit Deming Yang. 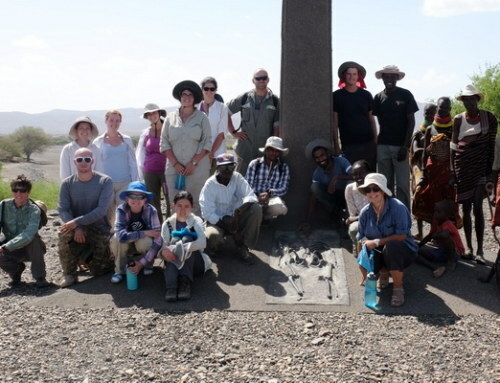 Halfway through their first week of the Ecology module, Professor Dino Martins, director of Mpala and an entomologist specializing in insect plant interactions such as pollination, took the students on a small hike up a nearby mountain called Mukenya. 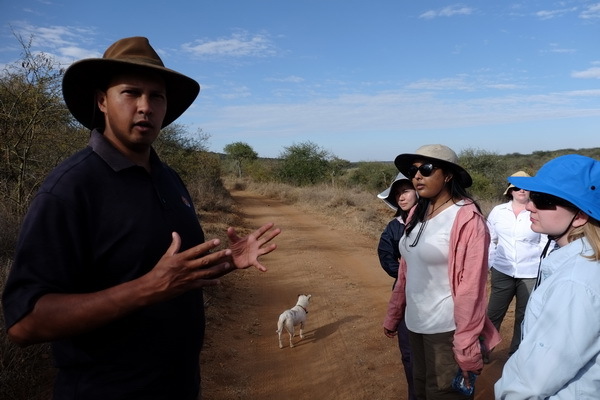 Ecology Professor Dino Martins, Director of Mpala, sharing his knowledge of dry land plants with the students. Photo credit Deming Yang. Students pause to look at the landscape as the make their way up the mountain. Photo credit Deming Yang. 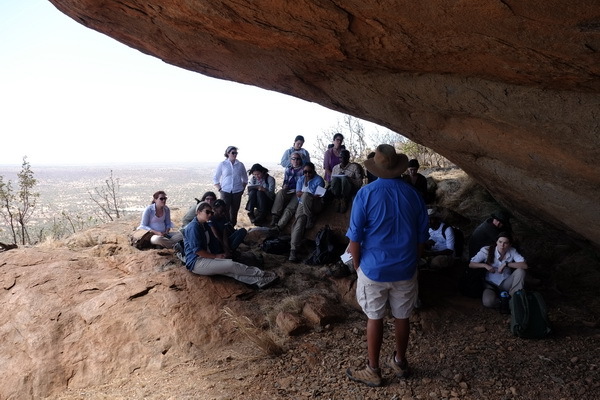 Professor Martins giving a lecture under a rock shelter on Mukenya…. or as Charlie called it “The coolest lecture ever!” Photo credit Deming Yang. Even Barabara enjoys the view! Photo credit Leah Neiman. On the way back from our hike, Professor Dino Martins stopped at a water hole to allow students to observe how species interact with one another. Students excitedly observed the behaviors of various animals, including both elephants and domesticated cattle as they took drinks from the water. 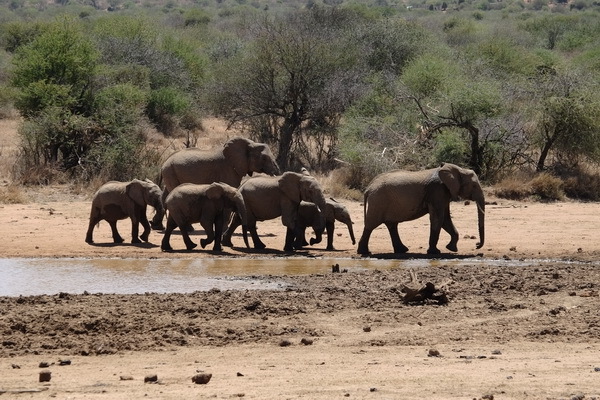 Elephants leaving after they took a much needed drink at the water hole. Photo credit Deming Yang. 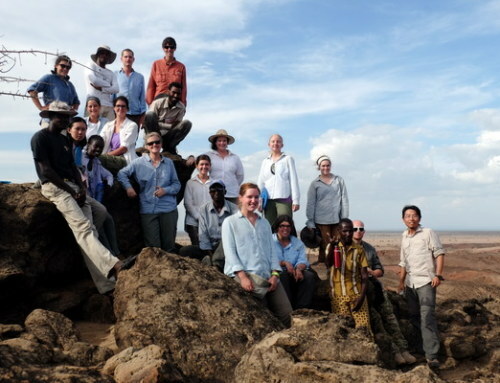 Students excitedly await the adventures to come during their last few days at Mpala Research Center! Kim and Leah looking happy to be in the field! Photo credit Deming Yang.